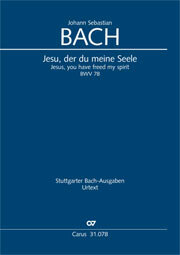 Bach's Reformation cantata, based on what is probably Martin Luther's most famous hymn, evolved over a period of several years. At the beginning was a Weimar cantata for Oculi Sunday 1716, now missing, which was based on the hymn with an instrumental quotation in the opening aria and with the final chorale. 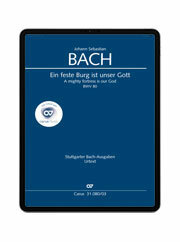 In the Leipzig years around 1730, Bach wrote a cantata for Reformation Day using this material. 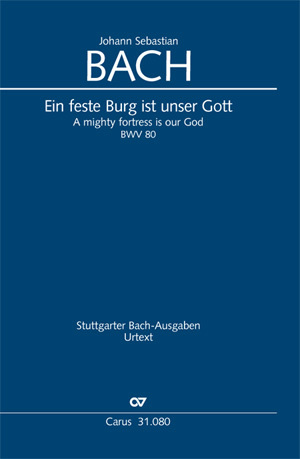 It began with the first verses of Luther's hymn in a simple four-part setting and also included the other verses. Later on, in the 1730s or 1740s, Bach replaced the introductory chorale movement with a chorale setting which was unique, spacious and motet-like in its style; this – uniquely in this respect – incorporated the choral writing in an instrumental canon for oboes and organ continuo. The powerful opening chorus is followed by recitatives and arias which reflect the full breadth of Bach's art of word painting and emotion. 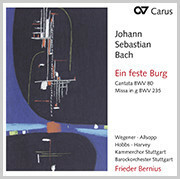 One of Bach's most magnificent cantatas, one of the greatest works in the history of music. In addition to the complete performance material the arrangements of movements 1 and 5 (with 3 trumpets, timpani as playing score) by Wilhelm Friedemann Bach are available (Carus 3108089).